Inside you’ll find a sample daily schedule for toddlers. Here’s a sample daily schedule for toddlers (my 4 kids 4 and under). Read my newborn routine, 6 month routine and 18 month routine. And here’s a post with a few toddler schedules as well. I have a 6 year old, 5 year old, 4 year old, 2 year old, and a newborn. But really, there are some pros and cons to having children close together, but it isn’t as hard as you think. We have a few key routines throughout our day that keep us sane. They keep us grounded. They prevent us from all running around like chickens with our heads cut off. Or, at least, they keep us all running around in the same direction. It’s simply impossible for me to get through our day without losing my mind if I don’t have a basic schedule. Have you ever had diapers explode on you? They explode on me. I’m talking crystals, people. If I don’t have things flowing properly, I forget to do basic things. I run around like a chicken with my head cut off and my kids are aimless. Aimless and wild. But not wild in a good way. 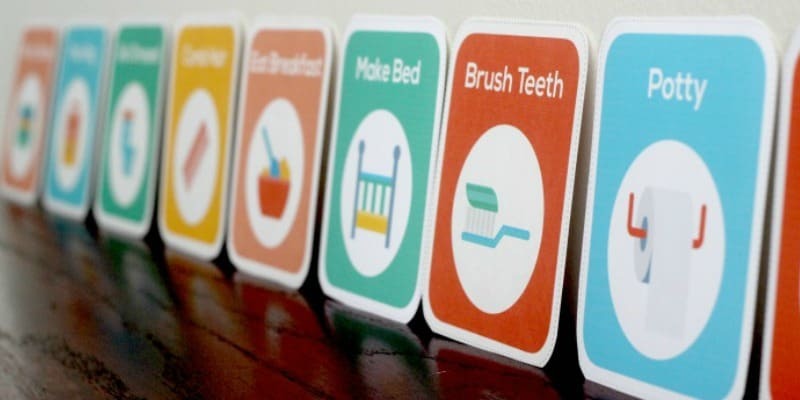 Use printable routine cards to teach your toddlers and preschoolers to follow their own routine without nagging. I’m a big fan of sleeping as late as possible and having my kids join me in this. We get up around this time (everyone but the newborn) and head to the kitchen counter for breakfast. I get the older kids breakfast ready and then go grab the newborn to feed him his first feed of the day. This clock may help your early risers. I chose this time to begin the newborn’s day because I can’t feed him and make grits for 3 kids. Just ain’t happening. I turn on cartoons for the older kids while I feed the newborn. Now, I don’t think watching TV first thing in the morning is good (actually it irks me every day to do this), however, I find it very difficult to feed the baby with 3 other kids who aren’t focused on something else. I’ve decided our screen time will be in the morning for this season so I can feed the newborn in peace and they eat and watch some cartoons or videos in peace. It isn’t ideal, but it works for now. Otherwise they are jumping on me and the chair and trying to kiss, cuddle, and hug the baby and it’s too distracting. After I’ve put the baby down for a nap, turned the TV off, and we’ve cleaned up the kitchen it’s time for random free play. I must admit this is a challenging time of day for me because the kids have energy, but can’t run free outside yet. Our yard is 10 acres and has a pond, pool, and road with fast cars so I can’t put them outside to play free and I can’t run free with them while the baby sleeps. (Update: we created a large fenced in area so the kids will usually play outside together). I put each of my kids in their own rooms (my 18 month old in his crib) to play on their own. Independent play has tons of benefits, and one of the best in my eyes is the fact that they don’t have to share those toys. All day they either have to share or fight for toys, but I rotate the toys that they play with in their rooms so it’s new and fresh often. Here are some bestselling age appropriate toys. While the older kids are still in independent play I feed the baby again. I do this on purpose because I like to nurse when there aren’t lots of other kids running around getting into things or trying to sit on me. I think it’s calmer and helps prevent over-stimulation which often happens when there are 3 kids trying to kiss him and hug him at the same time. By time I am beginning to put the baby down for a nap and the kids are out of independent play. This is when we’re doing our Fruit of the Spirit preschool curriculum, crafts, or an activity, or we all go outside to play ball or run around. I find the kids need some structure after they’ve been left to their own devices for most of the morning. I used to stress about activities or organized playtime, but I take the terms loosely and have found lots of things on Pinterest that are basically very minimal prep and high returns on kid excitement and learning! These kits make craft time a breeze. We all come back to the counter and eat. I think eating before nap means they sleep sounder and longer, but that’s just my theory. A theory that has born out for 5 children. If in doubt, give a bit more food. I put the older 3 kids down for a nap in their own rooms. I have old radios, white noise apps on my cell and tablet and turn those on so no one wakes anyone else up. It works perfectly! One can wake early, wake crying while teething, etc. and the others aren’t disturbed. When the older kids are down I feed the baby and try to get some rest. I’ll watch a TV show on Netflix, work a little, and take a quick disco nap before the kids wake up. I feed the baby again now to beat the dinner time preparation rush. I know some are uber talented, but I’m not yet able to hold a baby and nurse while cooking. The thought makes me want to order pizza. Anyhoo, the kids can get up and do something together or go get a snack while I’m feeding the baby and putting him down. If I have a short educational video I will often play it at this time, otherwise the kids occupy themselves while I get dinner ready. We usually eat around 5. We started eating this early because my husband worked nights a few nights a week and this allowed us to all eat dinner together. We are slowly moving it back a bit, but the early time allows us to eat with leisure then begin the nighttime routine without a rush, and still get the kids to bed at an early hour. After dinner we often read this book at the table together. The children get baths most evenings unless the day has been hectic and there’s not time. Unless they are filthy I won’t move back bedtime just to give them a bath. Mainly because bath time is fun for them and will amp them up so moving back bedtime + amped up kids means they take longer to go to sleep and they fight the bedtime routine more. In this time we do baths, get on jammies, read books, and clean our rooms. In this time I also feed the baby and give him a quick catnap before bed. 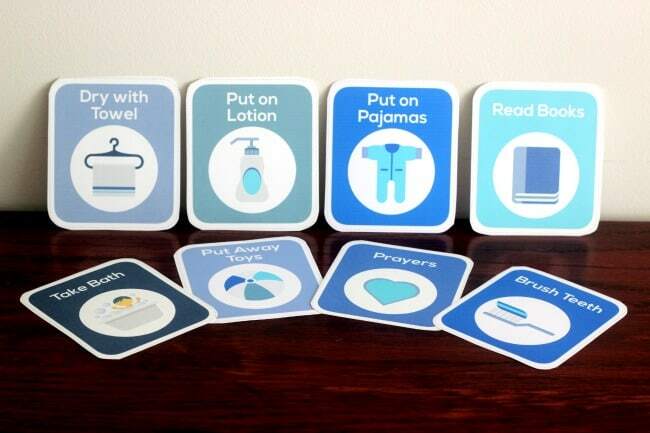 These printable routine cards are great visual reminders that will help you and your family keep the routine. My 18 month old needs to be in bed by 7 on the dot. Any later and he cries and fusses quite a bit. Even if we put him in at 7 he’ll talk to himself and sing for a while, but then go happily to sleep. 7:15 and he’ll try to bring the house down. My older two are more flexible and after reading some books, having “schnuggles” in bed, telling stories, and praying they are all in bed by 7:30 on most nights. Once all the kids are in bed, I get my little baby and I hug and kiss him and tell him how perfect he is… and then I get him ready for bed. Here are some wind down routines for babies. 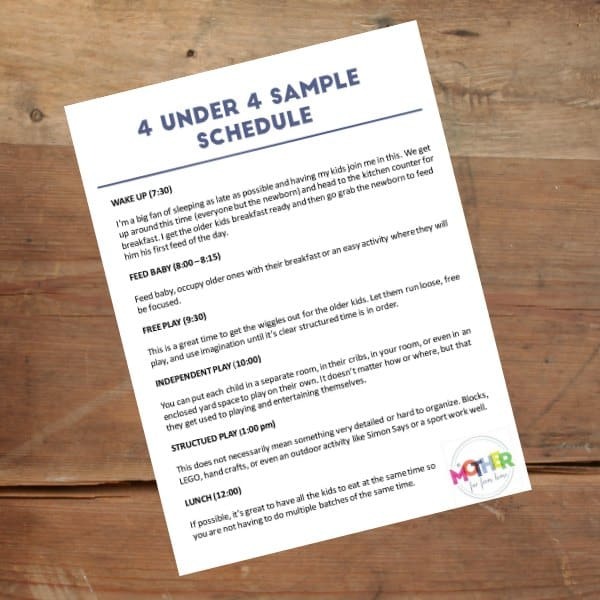 Chores – since my oldest is not yet 4 (turns 4 in March) we don’t have a chore chart or system. All throughout the day I have them put their plates/bowls by the sink, help me sweep by using the dustpan, clean up their toys, put dirty clothes in the laundry, etc. I don’t have a time set aside each day for chores yet. I see this coming soon. (Update: I have this but it’s a tad cumbersome to use). You might prefer to just have some printable chore cards and choose them at random. My work – I work either while they’re having screen time, during independent play, their nap time, and after they are in bed. Work is a way I can help provide for my family, but I don’t want it take over life so that I don’t have time for them. It’s a juggling act, but it works for now. Outside time – We are planning and in near execution stages of a large fenced in play area so the kids can go run wild and free and climb without my constant presence, and I think I’ll put that in the morning during their current screen time or after their independent play. Errands – I will not run errands with all 4 kids. Not worth it ever. I will grocery shop or do other things when someone else is around to watch one or all of the kids. (Update: well sometimes I have to and, when I do these are my tips). Want Routine Printables and Cards to hang up? 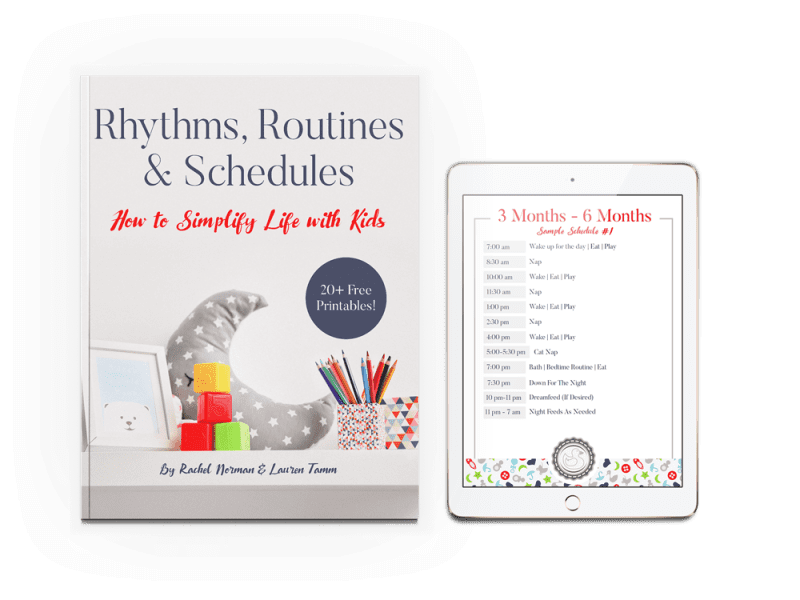 If you have a mix of babies, toddlers, and preschoolers and wonder what is a good routine that will serve everyone and – more importantly – want helping keeping track of the dadgum routine, then I’ve created something for you. 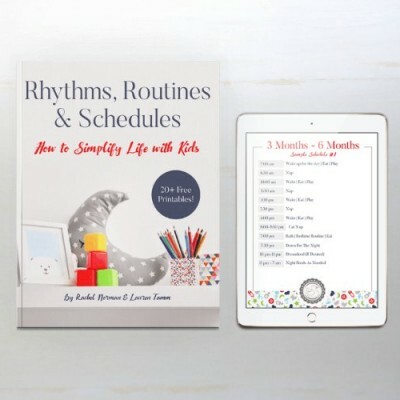 I’ve bundled my Rhythms, Routines & Schedules ebook (that has 25+ sample routines for babies, toddlers, preschoolers, AND combination schedules) and my routine cards into one package. The routine book itself has 25+ printables (3 for every age group) and some blank pages where you can write your own schedule and hang it up. For your toddlers and preschoolers you can use the routine cards that cover morning, play time, mealtime, chore time, and bedtime routines. This helps your older ones follow their own routines while you are tending to the younger ones. 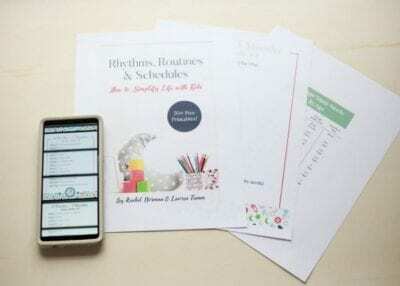 Get your routine ebook, printables, and cards here. I’ll have to follow you on Pintrest, my idea of crafts is crayons or play doh :) I have a 3 yr old and a 9 month old and I find it hard to have time with the older one without baby. She loves baking and puzzles, but both are very difficult with a baby too :) Do you have time built into each day, or do you do dates or such? I am telling you those are my ideas of crafts too Ha. I just went to Wal-Mart recently and picked up tons of paper, stickers, etc. glue, popsickle sticks and that has made it easier. I can quickly find something on Pinterest and usually have everything I need. I usually do those things around the same time each day because I don’t move around when I feed the baby! So — basically, you light you hair on fire and run until the sun sets! LOL —- I know my Mom was just like this with 4 under 5, and then again with another 4 under 4 when the rest of my sibblings came along. You (and other moms like this) are my hero! Oooh Rachel wow. I can’t even imagine what your day would be like without a schedule! I think sometimes, I’d truly love to read how people actually do it? Like how do attachment parents do it ever? How do you nurse/rock a baby to sleep and a two-year-old at the same time? It truly amazes me. Anyway. Girl that is EXACTLY what I am doing. Just today we discussed the type and size… I’m glad you echoed my thoughts that it’s a must have! Hi I am a mom of 3 boys. They are 2 year old, 1 year old, 1 month old. I am having trouble getting them to listen also stay out of things they aren’t post to get into especially when I’m feeding the baby. Also my two year old hits and pushes my one year old and I been trying to get him to stop and he won’t. Does anyone have any advice on how I can get them to do stuff while I am feeding the baby so they won’t get into things or to get them to listen to me they listen to daddy but he isn’t here all the time. Also I could never get them to stay in their room and play by their self. We packed up most of their toys cause they were being destructive with them. I am still learning and could really use some advice. And also we can’t go outside right now it’s way to cold. Hi Kimberly, oh girl…. I am telling you I understand your issue!! !One thing I have done is to feed the baby when the kids are occupied. So if they are in their rooms (even for 20 minutes), napping, or watching cartoons. Also, what I would do when your kids won’t stay in their rooms, you can say “it’s room time.” Give them nice toys and tell them they can’t come out. If they do (this is what I did) I would put them in time out or something for a minute or two. Or I’d put them in their cribs with toys so they couldn’t get out. Now, this is not an all day solution clearly, but for 30 minutes when you need to feed a baby it works! Rachel I now have a almost 5, 4, 3 and a 2 month old. I’m looking for a schedule to help settle them down and did I mention their all boys. They don’t have their own rooms cause we have a three bedroom baby is in my room then two boys in one and then one boy in the other room other then on weekends then my husbands older son is in there. I really need a schedule that works for my active family. I’m breastfeeding my two month old. I want to start working out plus want to start teaching the kids the stuff they need to know for school so like have a school time to teach them. But I’m struggling with a good schedule. I too have 4 under 4! Up until a few weeks ago I had a 3 (now 4!) year old, a 2 year old, a 1 year old and a 3 month old! Your schedule is looking mighty familiar! ;) Congrats on the crazy good bunch of littles you have! It’s such a sweet (and sometimes hectic) moment in time! Love and encouragement from this Momma to you! But Rachel, when do you eat, bathe, and cook? I do laundry randomly when I get a minute. We all just go to the laundry room, do it, and I get the two oldest to help me fold the towels, etc. I don’t have a set time yet. :( I never cook more than one meal at a time and only do one hot meal a day!!! When mine are asleep I DO NOT do any chores or work type stuff that I don’t enjoy. Otherwise, why wake up? Ha. My kids are at different ages then yours, with my twins turning 5 in April, and my son turning 2 in March. Yes before the newborn that was very similar to our schedule! I had to tighten up. Ha. It must be very challenging! I am a mother of 1 child (almost 18 months old) and I hardly find time for anything! Somehow I found time to read your blog recently and I really like it! How do you manage a newborn and an 18 months old at the same because they both need constant attention? how old is your newborn? Hi! Thank you – it really helps! Independent behavior. I leave my son several times a day in his cot bed with his toys while I prepare food, wash, clean, eat, etc. Not because I want to, but because I haven’t got much choice to be honest. I was always feeling guilty of doing it, I wish I had someone to help me at home, but I am also a mother far from home, so no relatives here to give me a hand while my husband works. I see now that encouraging independent play it’s not a bad thing for our little ones and can give us mothers some ‘time off’. But, hey, you must be a tired mummy! Please share some tips how do you handle tiredness! Hi! Thanks for your advise, I have done so, I searched for more articles on ‘tiredness’ and yes, there are plenty of good advise! I love your blog, when do you find time to write your blog?! With 4 little ones! Wow. I am sure you must be a very well-organised person with lots of energy. I have been struggling lately with my energy levels, but for some reasons, since I started going to sleep earlier (around 10 pm) I wake up more refreshed (well, not exactly refreshed, but at least not dead-tired, if you know what I mean! Ha! So yes, lots of great advise on your blog, I will keep reading! Thanks! Girl, I go to sleep at 9pm. Ha! I get up around 5:30 am to work before the kids get up then occasionally during nap :) I try to work in big spurts then take the rest of the time off! Going to sleep at 9 is very good, I tried it few times and never regreted! This is almost exact to our daily schedule, though we don’t have as many kiddos as you. We are expecting # 3 and my oldest is 3 so 3 under 3. I love your blog!! Rochelle, thank you so much :) Gerat minds think alike! This is very helpful, thank you for sharing! We’ve got our third on the way and I’ve been trying to get some routine ideas for when that happens. This helped me feel like it’s doable! I always tell myself I’m going to get better at my daily routine, but always get in my own way lol. I like this though! I have a 4 year old, 3 year old, and 18 month old. I like how you encourage independent play, but I worry about using my youngest’s crib for something other than sleep. Have you run into any issues with that? Thanks! I was reading this thinking, seriously, did I write this in my sleep and not realize? This is very identical to our schedule except I use our gym childcare for my work. I have 4 kids and my oldest is 4 and I work as an online college professor and church planter and children’s director. Thank you for writing this! It helped me focus quite a bit. I have a 4 yo, 2 yo, and just over two week old. My baby girl was born at 35 weeks, and she’s my first preemie! When did you feel like you could be on more of a schedule with 3? having a preemie has thrown me! We’ve focused on weight gain for her the last two weeks and waking her every 2 hours to nurse during the day (3-4 at night). I’m hoping we can have a better routine (2.5-3 hrs between feedings) within the next few weeks before my husband goes back to work. Also what do you do if the baby won’t sleep or wakes early? Because of my daughter being born early, losing weight and having trouble nursing (she’s getting on track now), she’s been held a lot and has little to no wake time after most feeds. I’m starting to freak out about what I will do in a few weeks when I’m by myself with all 3 kids! Keri, I always aim towards the schedule but go with the baby. Even newborns! Of course they don’t always follow it, but at first I’d even do a 2.5 hour schedule for the baby and if they woke happy enough, not feed until time. If they were hungry, I’d feed but still try to get towards that routine. I think you’ve done JUST RIGHT with your baby so no worries there. But I’d probably start trying to transition into a routine while you still have help around so that you won’t be in for the shock of your life. Thank you! I realized afte the fact that most of these comments were in 2015 so thanks for responding:-) did you ever do a dreamfeed? I’m setting my alarm for 10:30/11pm but always sleep through it. I’m trying to decide if it’s worth it at this point or if I should just wait until the baby is a little older. I ALWAYS did a dreamfeed and loved it! Sometimes, yes, the baby had a hard time waking up, but as the weeks went by they got used to it and it gave me that many more hours of uninterrupted sleep. Thanks for sharing your schedule! That helps a lot! So, what do you plan to do when the older ones stop taking naps? I’m asking because my 3 1/2 year old is done with naps mostly. She now does quiet time and reads books or plays quietly. I’m just wondering what to do once my 2 year old is out of naps as well :/ We live in a 2 bed apartment, so I guess they could play in separate rooms, but prob not for the 2 hours that my little one sleeps right now. Just not looking forward to loosing the tiny bit of me time that I have… Thanks for your input! I still put them in. My 3-year-old currently still naps 5/7 days, though my 4 year old (5 next month) only naps 1 or 2 days a week at most. I put her in her room anyway, though without the independent play in the mornings. She doesn’t need al that much time. I just try to make it happen no matter what, as you said, for the tiny bit of me time! I have 3 3-and-under (3, 2, and eight months) and wow, can I not find anyone in the same boat as me! Most of my grad school friends aren’t even in committed relationships. Your blog is a breath of fresh air. Glad I am not alone in the knee-deep-in-kids madness. YOU ARE NOT ALONE :) Ha. Hi! I’m back again:-) so I decided to implement the same Schedule with my 3 kiddos (specifically the newborn). How long did you let the newborn sleep at night before waking them? Or did you wake at night? My baby is 5 weeks old now and gainin well, so we’ve been working on a schedule and sleeping independently. At what point did you move the baby to a 3 hour schedule? Also I’m wondering what to do if the baby wakes up at say 6am when I’m planning on getting her at 8. Maybe just feed on one side? Thanks again! We’re doing a combination right now-3/2.5/2. It seems to work ok, but I feel like she might do better on a full 3 hour schedule. We’ll see! For older children not taking naps would you have them do quiet time the whole 2 1/2 hours? Thanks! Also what do you do when your little ones wake up before their nap time is suppose to end? If they’re happy I leave them in the crib, if they’re unhappy I’ll go to them, of course, but try not to move up the feed unless they’re starved. Rachel, I love your daily plan. With the fruit of the spirit curriculum, would it be suitable for an almost 4 year old? I saw that it says 2-3 year old..but I am looking for something just like this!! Any recommendations? Heather, i think it would be suitable. If she is super advanced maybe you’d have to beef it up a bit, but it’s basic and easy to follow and you can easily bring the level up and down. Thank you for this! I just had my 3rd and things have started to fall apart a little. Mine are 6 weeks, 2, and 3. I am going to try this out. We travel, so the unsupervised outdoor time might be hard for me, and it makes me wish I had my own yard again . I love your attitude of “this isn’t so hard.” People always think young ones are so terribly difficult, but I think changing the perspective makes a huge difference. I swear my kids know when I’m too tired to deal with them, and they act crazy. But when I’m feeling good, mindful, and confident, our day is smooth sailing. Brittany, girl, I loved this phrase “my kids know when I’m too tired to deal and they act crazy.” These kids have a honing beacon, I just know it. Just found your site. My mom raised 9 kids, some of them very close together…and I thought I would naturally fall into the role myself. Nope. My two boys are 19 months apart, and I am getting listless and discouraged. Despite the fact that I am a professional organizer, my head turns to spaghetti when I try to figure out how to wrestle a productive and meaningful day for me and the kids. I roamed the internet looking for sample routines, and yours won out :) Plugging it into a schedule app so I have little reminder dings while I get into the swing of it. My biggest struggle right now is occupying my two and a half year old….he does play well by himself, but I am Chief Playmate until his little brother is older. And truth be told, playing with a toddler can be frustrating and boring at times!! Lauren, I have a few friends whose older kids have gone to school and they only have one toddler to entertain. It’s tough! :) Love that you are a professional organizer, though, when they get older you’ll have that home running so smooth! I feel your pain! Ha. All these kids and we have to find a way through that works, bless you! Hey I have two, 34 month and 20 month old, the question I have is when do you give them milk, how many Oz’s, do you breastfeed any of the other children? I only breastfed until around one year for a few reasons, but I usually give milk around 4 or 5 times a day. Breakfast, lunch, dinner, and then two snacks between if they’ll take it. Sometimes I do water for snack or meals and then I gradually give them more water and then half milk and half water. Sabrina, major congratulations and YOU CAN DO THIS! Wow, this is so helpful! I had 4 kids in 4.5 years and I also work from home. My oldest is now 5.5. A couple of quick questions: 1. Do you have an updated routine now that your newborn is no longer a newborn? 2. My oldest has ADHD. Do any of your kiddos have a similar issue? Thank you for sharing this! We try to do chores each morning for a few minutes, I have a cleaner come once a month to do “deep” clean. I usually do two loads of laundry or so a day then catch up on one big day. And then I fit things in the cracska best I can :) Ha. You knkow. Hi there! I really enjoy reading your posts. I also am a mother of 5… The last 4 being ages 4, 3, 2, and newbie. The struggle is real… Ha! But I wouldn’t have it any other way. Thanks for the tips. Hi I am a mother of 3 under 3 and I have a hard time getting a schedule down cause I can’t wake myself up in the morning to get going. What did u do to get your energy back up after having your babies back to back. I want to be able to get up and do my school work before they wake up and and have milk and breakfast ready for them. I feel like a failure when I don’t and I want to be able to clean the house and have everything looking nice before my husband gets home and dinner planned ahead of time. I could use some help. Kimberly, one of the biggest things I do is go to sleep. I try to sleep. I also explain to my husband that certain expectations he may have will not happen and then I don’t try to stress too hard about how I look right now. It’s a short season and that brings a LOT of guilt if I try to look cute every day when I’ve barely fed everyone. I also try to wake up even just 15 minutes earlier. When it feels so good to have that time I maybe move it to 20 minutes. And most importantly YOU DON’T HAVE TO BE PERFECT right now. It is a hard time and you are doing fine. Thank you so much. I just struggle to get to sleep at night even when i tell my husband no to the expectation. I’ve tried sleeping pills from the doctor they worked but I wanted to do this on my own get my energy back so I can do more with the kids during the day. But yea I get what you are saying. HI. I notice you only take a short nap every day. How do you deal with the lack of sleep?Despite my best sleep training efforts my kids wake up 2-3 times a night until they are a year old. The lack of sleep was almost maddening when I had my third and I was very irritable with my other kids. Trying to avoid that again since #4 is due in September. Any survival tips for me? I appreciate you taking the time to answer my question. I did read on another blog that nursing lying down in the middle of the night helps with fatigue so I will be doing that this time around. And I also go to bed at 9pm! The Lord bless you and your beautiful family! Please ignore my previous comment. I was trying to type something up and accidently copy and pasted the wrong link in. Anyways, thanks so much for the tips!! I have a toddler that I’m trying to set a routine with, so I really appreciate this article. I got inspired after reading a similar article by Petit Early Learning (https://www.petitjourney.com.au/10-reasons-a-daily-routine-is-important-for-your-child-and-how-to-set-one/). I didn’t realize how important it was to set and stick to a routine with my daughter until she started getting older. It’s been a wild ride, but here’s to hoping it gets smoother. Good luck :) You can do it! I need help with transitioning from 2 to 1 naps. I have a 3 year old boy and 17 month old twin girls (16 months if using adjusted age). We’ve been transitioning for about a month; started by pushing morning naps later and shorter. I’ve used your routine books for schedules and I’m at a loss right now. I’ve been putting the girls down around 11:30. One wakes after 45min – 1hr. I usually let her fuss/scream for 15 min and most of the time she doesn’t stop crying and I end up getting her. My other daughter was doing great with a 2 – 3hr. nap until recently. She’s been waking after an hour with a dirty diaper consistently. My 3 yr old goes down around 12:30/1:00. I’d really like to consolidate to 1 nap time, plus we are going on vacation at the end of July and the 1 nap would be really helpful. Do I just push the girls to 1pm nap even though they seem tired earlier? I’m afraid to make them overtired. Or does it just take their bodies awhile to learn to take longer naps? What do you do about play dates/library trips/etc? Were these ever a regular thing for you guys? (I only have two kids right now- 3 yo and 9 months) so these things happen every week. Also Sunday for church and then there’s weekly small group! How do you work with that??? Do you just never leave your house? And if not, how do you personally cope with that? I do leave the house, but we don’t do daily playdates or anything so I’d usually choose a day or two a week that we did things and the schedule went off and we coped. But we didn’t do it daily for sure! I do get stir crazy, but it’s usually NOT worth it to me to take babies who are normally sleeping out of the house because then we’re elsewhere and they’re fussy and that makes me stressed. Does that make sense? Dumb question but my kids do not have their own room so how do I do independent play, away from each other? I figured almost 5 year old in the bedroom and 14 months old in the pack and play in the living room? YES. Exactly. YOu can do one in your room one in the kitchen or one in their own room. Or you can rotate who has independent play when so one child is in the room then after that the other. Oh my goodness, this is so enlightening. I have a 4 year old and 18 month old, but I’m also a caretaker for both of my parents, due to major health issues (most recently, father’s cancer, mother’s amputation). Honestly, our lives have just been chaos since my oldest was about 6 months old, and they have never had a regular routine or schedule because of constant hospital trips and endless doctor appointment and rehab schedules. And we are all paying for it now. My 4 year old has so many behavior problems and stress and anger. And I know a lot of that could be alleviated with a little bit of consistency in our lives. But now that we’re seeing a light at the end of the tunnel with my parents, how do I undo the damage of not having had them on a regular routine? And how do I introduce it? Is there any hope for my babies? Tiffany, there is absolutely hope for your babies, girl .You did what you had to do to serve your larger family and that is not only “okay” that is right. Just do the best you can when you can. HOW, HOW, HOW did you “train” your 18 month old to play independently in his/her crib?!?! And at what age did you start this? Inquiring minds want to know! My little one has a nap at the same time give or take 15 mins, but I miss out on some social activities as a result. Do you just accept the sleep times as set times that only big things like weddings and doctors appts (that you cannot move) will change the sleep times? My boys are 3, 2, and 8 months. We go from enriching days of homeschooling to days where I let my toddlers watch Paw Patrol and jump on couch cushions sprawled across the house. How do you not get burnt out from the constant routine especially when your kids have those days when they don’t want to listen or participate? My 2 year old is far more engaged in learning than my 3 year old. Is there a strategy I can use to get my 3 year old interested in learning? – My oldest and middle have both dropped napping and my 8 month old is only napping 45 minutes a day. I have a four year old and I can’t imagine him sleeping 12 hours at night plus taking a 2 hour nap in the afternoon. Do your older kids just rest or do another independent play time in their rooms at 1?